Fig. 13-8. Modulation Types Commonly Used for Digital Signal Transmission In Satellite Communications. R is the data rate. The shaded region is the required bandwidth. Frequency shift keying (FSK) sets the carrier frequency at F1 to transmit a binary 0, and at F2 to transmit a binary 1. The separation between F1 and F2 must be at least equal to the data rate to avoid performance loss from mutual interference. Thus, the transmitted spectrum width is at least twice the width of the spectrum generated by BPSK. Multiple frequency shift keying (MFSK) sets the carrier frequency to one of M frequencies. For example, for M = 8, the first three binary bits, 010, determine that the transmitted frequency will be F5. The next three bits, 011, set the frequency at F6. The symbol rate is one-third the bit rate, and the transmitted spectrum width is about 8/3 the bit rate, where the separation between frequencies is the symbol rate. 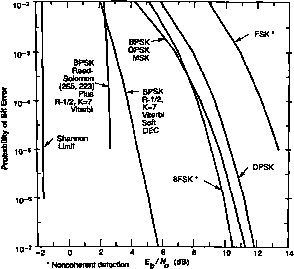 Less common spaceflight modulation schemes include minimum-shift-keying (MSK), offset-QPSK (OQPSK), 8PSK [Sklar, 1988], and BPSK/PM [Yuen, 1983]. To demodulate a digital bit reliably, the amount of energy received for that bit, Eb, must exceed the noise spectral density, N„, by a specified amount Communication theory derives the Eb/N0 needed to achieve a required bit error rate, BER, at the receiver output (see Sklar , Chap. 3). The BER gives the probability of receiving an erroneous bit. For example, a BER of 10-5 means that, on the average, only one bit will be in error for every 105 bits received. FSK- and MFSK-modulated signals are usually demoduiated by measuring the received power at each of the possible frequencies, and selecting the frequency with the largest power as the one transmitted. An advantage of this technique is that any variations in carrier phase introduced by the transmission channel (such as multipath) will not greatly degrade the link performance. For this reason, these modulation types are often used in military communications satellites (MFSK) and command links (FSK modulation of a subcarrier). On the other hand, demodulation of either BPSK and QPSK requires us to measure the phase of the received carrier. Thus phase distortion caused by the transmission channel will significantly degrade performance. The effect of this distortion can be reduced using Differential PSK (DPSK). This technique requires no change in carrier phase when transmitting a binary 0, and a 180-deg phase reversal when transmitting a binary 1. At the receiver the phase of the carrier received during each bit period is compared with the phase received during the previous bit period to determine whether a phase change took place. This modulation technique overcomes distortion effects provided the phase changes between successive bit periods are small (< 20 deg for < 0.5 dB degradation). Unfortunately, both BPSK and QPSK modulation experience sudden phase transitions at the bit boundaries. These transitions generate sidebands outside the main signal spectrum which may interfere with an adjacent frequency channel. But if the carrier phase is gradually moved from one phase position to the next during the bit period (from 0 deg to 180 deg, for example), then the sideband power is greatly reduced. One version of this technique is Minimum Shift Keying (MSK) [Sklar, 1988, Sec. 7.9.2], These bandwidth efficient modulation techniques are particularly useful in communications satellite systems with multiple channels closely spaced to fit the available frequency spectrum. 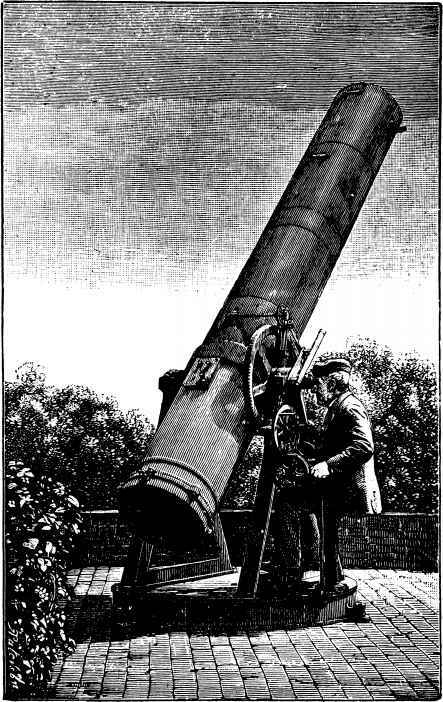 * FireSat will use this technique for the uplink. carrier. For a phase modulation of ±1.0 radian, the transmitter power is divided between the carrier (60%) and subcarrier (40%). Figure 13-9 shows how the BER varies with Ej,/JV0.Table 13-11 lists the types of digital modulation commonly used in space communication systems. Fig. 13-9. Bit Error Probability as a Function of Eo/A^-The theoretical performance limit can be approached by use of error correction coding. For the digital systems discussed in this chapter, the BER is used to evaluate the performance of the link. On the other hand, analog communication links are generally evaluated in terms of the output signal-to-noise ratio, S/N. The S/N is a function of the C/N, the modulation type, and how the S/N is expressed. For example, the S/N of a frequency modulated (FM) television signal depends on the modulation index and the pre-emphasis plus weighting factors in addition to the C/N (see Morgan and Gordon , Sec. 3.4.5). TABLE 13-11. A Comparison of Several Modulation and Coding Schemes Used In Satellite Communication Systems. The theoretical values of Eb/N0 shown must be increased by 1 -3 dB to account for filtering, timing, and frequency errors. See text for definition of modulation schemes. In the bottom row R = data rate and fa = subcarrier frequency.